Download content as a PDF. As we examine racism and recommit to racial justice this Lent, it is vital that we address the attempted systematic destruction of the Native peoples of North America by colonizers, both ancient and modern. The United States was built on a foundation of colonization, racism, and genocide. This is an original sin of our nation, but it is not just a sin of our past. Today, compared to the national population, Native Americans have significantly lower median incomes, lower homeownership, increasing health disparities, and twice the level of poverty. These outcomes are the effects of a system of white supremacy. The Native experience is also one of rich tradition, faith, and resistance. Before colonizers landed on this continent, Native Americans organized themselves into tribal nations and powerful confederacies. The white reaction to the cultural and political power of Native Americans has been genocide legitimized by the creation of legal authority and institutional control. This system of white supremacy continues in the United States to this day. From the first interactions with Native Americans to the modern day, white colonizers in North America have worked toward one thing: theft. Theft of land, theft of natural resources, theft of culture and identity. Racial justice demands that we recognize and remedy these thefts. This resource cannot comprehensively recount the entire history of Native Americans, but we hope that this will be a starting point to begin learning about the peoples our nation has attempted to make invisible. Throughout history, white supremacy has demonstrated its power to reshape institutions and supersede legality. When President Andrew Jackson signed the Indian Removal Act of 1830, ordering the removal of all Native Americans from their tribal land to reservations, the Supreme Court initially attempted to side with the tribes, who had signed treaties that ensured their national sovereignty. President Jackson bypassed the courts, and bent the strength of federal institutions to further meet the needs of white supremacy. Between 1830 and 1850, President Jackson oversaw the forced relocation of 100,000 Native Americans at the hands of federal and local military forces, resulting in the loss of ancestral homelands and 15,000 deaths from exposure, disease, and starvation. These death marches were white supremacy made manifest, and the legitimation of land theft was codified. On December 26, 1862, six days before signing the Emancipation Proclamation, President Abraham Lincoln ordered the hanging of 38 Dakota men – the largest mass execution in U.S. history. These men had taken part in a Native uprising in response to broken treaties. This is just one example of the racist legal system created to suppress and remove Native Americans. The United States created treaties promising to end the theft of Native land, allowed the treaties to be violated, and punished resistance, all while pushing Native Americans out of their homes and into smaller areas of land. White settlers desired gold, timber, buffalo, and land, so the legal systems and institutions adapted to steal it all from the tribes that depended on the land’s resources for their survival. Recently, NETWORK staff traveled to New Mexico and hosted a round table in Albuquerque to listen to Native American leaders and leaders in women’s health, childcare, rural dental care, food security, and immigration sectors share their experience working to mend the gaps. New Mexico has a complex history of interactions between Native American tribes, European colonizers, and Spanish settlers which continues to shape the state today. New Mexicans also deals with a massive nuclear and uranium mining industry. In the 20th Century, the U.S. government has repeatedly participated in and allowed the theft of Native land, resources, and identity. From the Manhattan Project through today, uranium is mined on or near tribal lands, often at the expense of the Navajo and Lakota peoples, leading to extensive uranium poisoning and land contamination. Today, New Mexico is the only state in the U.S. with what is considered a cradle-to-grave nuclear industry, meaning that every process of building nuclear weapons and sustaining nuclear energy occurs or has occurred in New Mexico. The New Mexico Environment Department lists 22 permitted hazardous waste sites in the state. This does not account for unpermitted sites, which also exist, including multiple hazardous waste sites related to uranium mining, milling, and processing. Many of the more recent siting decisions that have resulted in new sectors of the nuclear industrial complex in New Mexico have resulted because people in power have tempted poor communities overwhelmingly comprised of people of color with economic opportunities, many of which have resulted in death and disease, as was/is the case with uranium mining across indigenous communities in New Mexico. Eventually, New Mexicans, especially indigenous people, are blamed for this fate of willful participation, ultimately driving the status quo for expanding the nuclear industry in New Mexico, granting more federal funding to the state, thus making New Mexico more dependent on the federal government. After several successful Native uprisings led by warriors such as Red Cloud, Sitting Bull, and Crazy Horse, the federal government responded with a new method of legal theft. The Dawes Act of 1887 divided Native reservations into individual allotments and sold “excess” to white settlers. Tribes lost 90 million acres, nearly 2/3 of their land. Native Americans were pressured to sell their land to white people, dividing community land into fragments. Later amendments to the law removed federal recognition of tribal governments. The legal destruction of Native tribes was complete, but white supremacy demanded the destruction of Native culture as well. Boarding schools for Native children, often run by Christian organizations, were created to remove Native identities. At one such school, the motto was “Kill the Indian, Save the Man.” Native children were required to cut their hair, wear uniforms, speak only English, and take Anglicized names. Until 1978, Native children could legally be kidnapped from their families by the U.S. government and forced to attend these boarding schools. During much of our nation’s history, the federal government outlawed Native American religious practices as well. When Native Americans refused to have their culture stolen from them, the federal government responded with violence, exemplified by the Wounded Knee Massacre. My name is Yvette Pino. I am a Native American woman. I have lived on the Laguna Pueblo almost my entire life. I am a part of the Mescalero Apache tribe. Because I have lived on the reservation my entire life, I have seen the issues that affect Native Americans first-hand. These issues involve alcohol, education, and foster care. I have seen these issues play out in those close to me, as well as in the community. I have seen the never-ending cycle of alcoholic use, the cycle of foster care, and education. People aren’t challenged to pursue a higher education, because no one is there to do so. I love my community, it is a part of who I am but I cannot ignore these problems. I am an active participant in my parish community in Laguna, I have done volunteer work, I visited the nursing home often while my grandmother was alive and went to Mass with the residents. I feel the pain of my community, but I refuse to be a part of that cycle. I know God put me here for a reason. He has given me a strength to know that though these issues may seem like they cannot be overcome, that they will never go away, I know that with God, all things are possible. I was put into foster care at a young age, for broken bones that could not easily be explained away. At sixteen months old I was put into my first, and only, foster home. I have been with the same family ever since, through the lows of court cases and lack of visits from my biological mom, to the highs of my graduating from a college preparatory high school and acceptance to Notre Dame. I know I am incredibly blessed to be where I am now, but though my story of being a foster kid is not a unique one, many children are not so lucky. They bounce from home to home, yearning for that love that every human being searches for. They do this until their parents are able to offer that support system, but if the parents make one mistake, back into foster care they go. They do this for years, sometimes until they come to the age of eighteen where they have very little resources to make the decision to go to college, and so the cycle continues. They may turn to alcohol to numb the pain and loneliness, have their own children but find because they were not shown love, they are unable to show love to their children. Then their children search for love outside of the home and may turn to drugs or alcohol. Even though I am now going to college, and my brother is going to boarding school, my parents still struggle. This is all too common on the reservation and without the resources to send children to college, people on the reservation will remain here and feed the cycle of poverty. Native American resistance to the legal expression of white supremacy continues to this day. Much of modern Native resistance takes inspiration from the American Indian Movement of the 1970s, which temporarily repossessed the Native lands of Mount Rushmore, the Pine Ridge Indian Reservation, and Alcatraz. In 2016, over 15,000 activists from the Standing Rock tribe and around the nation occupied tribal land that energy companies planned to use for the Dakota Access Pipeline. This group came together to protest the violation of treaties and the destruction of sacred land and resources. The federal government and corporate interests responded with beatings, attack dogs, and legal action. Once again, white supremacy overruled the concerns of Native peoples, but the #NoDAPL protest revitalized national focus on Native rights. The systems of white supremacy that damage Native Americans were revealed to the world. In 2018, Representatives Deb Haaland and Sharice Davids became the first Native American women elected to Congress. While a sign of hope, this historic step toward representation is only the first. Racism against the Native peoples of our nation is not an issue of the past. The legal and institutional systems of white supremacy have had devastating impacts on Native American tribes, and those systems continue to this day. We must all recommit to racial justice for Native Americans and work to dismantle the systems of white supremacy. As one of two Native American Women ever elected to Congress, I know it is a historic time to be engaged in politics regardless of background. We have been elected to lead during a time of divisiveness; a time where white supremacy has been proliferated by the current administration, and, unfortunately, cited by some terrorists for their attacks. This has caused many issues, such as border security and those seeking asylum, to be blown out of proportion and grossly mischaracterized. My colleagues and I took an oath on January 3rd and I did so solemnly with the understanding of what it means to stand up, speak out, and lead when others in elected office are abusing their power and not honoring their responsibilities to their constituents. Your Love flared forth in brilliant galaxies, stars, planets, Sun, Moon and Earth, where life was born. In time, a unique multi-species, multicultural community of life emerged, encircling our Earth home. In your goodness, you have made us aware of our interwoven oneness in the human family, and our kinship with all creatures in your Creation. Yet in America, we witness deep historic wounds and divisions that continue to separate us as peoples, that alienate us from one another and all Creation. We are mindful of deep national wounds in our relations with the First Peoples who inhabited America for thousands of years before the arrival of European Conquistadors in the 1500s and Pilgrims in 1607. We lament present day dominant racist structures that render “invisible” the Indigenous peoples of America. We pray for conversion of our hearts and minds, that we may be open to learn from the wisdom, cultures, traditions and spirituality of Indigenous peoples, which have always been their strength, teaching them how to live in harmony. We lament the “Doctrine of Discovery,” Papal Bulls and treaties that denied and assaulted the God-given human dignity, rights, traditions and lands of Indigenous peoples in America and beyond. We pray for honest admission of historic sins as Christian Church that will lead to forgiveness, healing, restitution, and reconciliation within the institutional Church and with Indigenous peoples in this country. We lament the colonization, slavery and genocide of Indigenous peoples in America carried out by agents of the sword and cross. We pray for the grace to become true disciples of Christ in the midst of opposing forces, to help heal the wounds inflicted by our sinful infidelities, by our betrayal of Jesus Christ, His life, teachings and example. 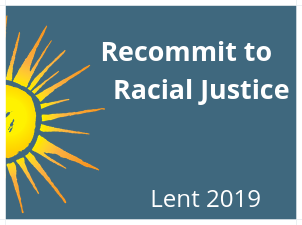 As people of faith, may we voice and advocate for the moral, ethical, spiritual and environmental justice imperatives in all government policy-making and legislation. We lament the policies of Manifest Destiny and military-enforced removal of Indigenous peoples from traditional homelands and their relocation to detention camps in designated “Indian Territory,” where thousands died from disease, exposure, and starvation, in the Trail of Tears, and the Long Walk. We pray for honesty and courage to confront and renounce white supremacist ideology, propaganda, hate speech and actions in our nation and communities, as we live out the vision of our essential oneness with all people as God’s family. We lament the U.S. government’s failure to honor hundreds of peace treaties with Indigenous nations in America, while pursuing policies to destroy their basic economic survival and cultural identity, by killing off the buffalo, controlling all commodities and removing children from families into boarding schools. We pray for wisdom, guidance and perseverance to hold all elected officials accountable, to fulfill their responsibility to serve all people, especially the disadvantaged, to promote the common good in upholding democratic values, and to respect and care for God’s Creation. We lament modern day forms of colonization through corporate and government disregard for tribal sovereignty, appropriating tribal lands and rights for private profit-driven extraction of natural resources, impacting health and devastating indigenous lands, water, air, plants and animals, as seen at Standing Rock and the Keystone Pipeline. We pray for wisdom and guidance for elected officials, local communities and concerned citizens to respect the sacred nature of water, land, wildlife and air as God’s gifts to sustain all life, to enact strict national regulations and policies that protect all people’s rights to clean water, air and land, to address challenges of climate change and promote transition to 100% renewable energy, while preventing corporate profiteering from commodification of water and extraction of natural resources. How often do you think about the impact that white supremacy has had on the Native American experience? Is this history or the continued struggle new to you? How have you benefited from the attempted destruction of Native Americans by white colonizers, both ancient and modern? How can you work for racial justice for Native Americans? Whose land are you on? Throughout our continent, before countries and states, vibrant and diverse tribes lived and cared for the land you are occupying. Learn more about the Native land you are on at native-land.ca. Think about how you might be able to incorporate this knowledge into your day-to-day life. Some ideas include incorporating into your personal or group prayer, or even beginning meetings with a description or a moment of silence to acknowledge the land you are occupying. An introductory guide to the relationship between tribal governments and the U.S. released by the National Congress of American Indians. NCAI was founded in 1944 to represent the tribes and resist federal government pressure for termination of tribal rights and assimilation of their people. A factsheet released by the Indian Health Service’s Federal Health Program for American Indians and Alaska Natives detailing the current health disparities in Native American communities. A Los Angeles Times article that provides an overview of modern Native art from across the country. Features works from Eric Tippeconnic, Gerald Clarke Jr., Pamela J. Peters, and Bethany Yellowtail. Native history didn’t end after the massacre at Wounded Knee. Written by Ojibwe author David Treuer, The Heartbeat of Wounded Knee melds history and memoir to tell the story of an era of Native activism that informs the social justice movements of today. Photojournalist Aaron Huey’s TED Talk on Native American history and his time on the Pine Ridge Indian Reservation. Huey’s photos include material that may be disturbing to some. Short documentary about Arron Huey’s work at Pine Ridge Indian Reservation, featuring artist Shepard Fairey. Kyle Bell’s documentary about Kiowa-Choctaw artist Steven Paul Judd. Profile of Pawnee-Yakama artist Bunky Echo-Hawk from Native Arts and Cultures Foundation. Includes video of Echo-Hawk’s live painting performance. This feature length documentary tells the story of the executed Dakota 38 and the yearly Reconciliation Ride that promotes reconciliation between Native Americans and white people. *This documentary has graphic violent historical imagery. A two-part series from NPR on the historical and modern impact of American Indian Boarding Schools.